Digital Currency Group's subsidiaries have had a cracking year in midst of a bear market. Grayscale, it's institutional geared crypto trading firm saw record inflows and Genesis Capital, the major investor's lending arm closed the year with over $1.1Bn in originations. But they're not the only trick in town as on-chain products also begin to find an audience. Last week Genesis Capital reported as doubling its loans in the last quarter of 2018 on the back of Bitcoin breaking below the $6000 mark. Loans would allow for investors to take positions gaining on the down-side. Michael Moro, CEO of Genesis Global Capital, disclosed to Forbes a further breakdown into the inner workings and demands of the lender's institutional clientele. While the company did see approximately 10% of their Bitcoin loans used to short the market, the majority, 50%, was in fact used for short-term requirements of Bitcoin suppliers, as well as those seeking spot market arbitrage opportunities. What has also substantially grown is the $20Mn in loans backed by cryptocurrency - a service only recently launched by Genesis. The company's report stated that " in response to client demand to borrow USD against crypto collateral, we launched a cash lending pilot program. The reception has been quite strong and we have decided to officially launch the new fiat currency lending business." Such facilities have only been readily available to accredited investors. However there are the opportunities now built on top of Ethereum that would allow for such risk exposure. Compound Finance, an on-chain platform that allows lending and borrowing has seen inflows and outflows to the tune of $85Mn after only launching late September 2018, and only starting stablecoin lending with Dai at the end of November. At the end of January, gross supply exceeded $20Mn. Its unlikely that Compound is being used to short assets considering the multi-step process it would require. The executed loans in tokens would also mark insignificant shorts as the platform's liquidity providers quickly flipped from supplying Ether to Dai a day after the option was provided (see chart). What Compound does seem to currently facilitate is lending in Dai with the likelihood of borrowers looking for more cryptocurrency trading exposure on the upside. Financial services on chain continue coming online. Last week saw the launching of Consensys-backed Nuo which also provides cryptocurrency backed loans. Nearly $215Mn worth of Ether has been locked up in Maker's Collateralized Debt Positions, with a potential upside on Pooled Ether. And risk seekers looking to short Ethereum can find leveraged options on dYdX's Expo Trading platform. || TEMPORARY CRYPTO ENTHUSIAST FAD? And while growth notable, the jury is still out on whether on not demand for on chain financial services will be sustainable, or follow the tumbling path that Decentralized Exchanges have succumbed to (Diar, 28 January). Cryptocurrency exchanges have kicked off the year on a slower note with trading volumes hitting new lows in January not seen since 2017. Partly accounting for a lack of volatility so far this year, exchanges could be set to enter a new plateau after coming off a record breaking year (Diar, 14 January). Notably, Binance has seen it's Bitcoin/USD market slashed by over 40% versus December-18, marking the popular token exchange's worst period since the now-largest exchange came to prominence in 2017. And while major exchanges did go into investment drive last year as they began seeding startups within the industry, its all a little fresh to bear any fruit (Diar, 8 October, 2018). Blockchain hype continues to garner major marquee outfits appetite despite very little commercial products coming online providing any new benefits. Last week saw IBM claim, again, a trial success for shipping processes as the technology behemoth drives forward a Blockchain partnership onslaught. In what appears to be a recurring press release by IBM, the strong enterprise blockchain proponent has said that it had completed the shipping of fruit from China to Singapore using an electronic bill of lading on chain. A similar success story, sans mandarin oranges, was heralded by the same parties involved, Pacific International Lines and IBM, last February 2018, for the same shipping route, after the two companies had entered a Memorandum of Understanding (M0U) in August 2017, with blockchain tests taking place throughout that year. All in all, an 18-month project for various parties to receive an electronic contract that aims to minimize fraudulent claims. IBM, having employed over 1500 employees to its blockchain unit, has much to prove now years into research and development with no actual business returns other than a hoopla of blockchain trial "successes." It has however managed to attract the interest of major players in each respective industry (see table). How and when this will play out will ultimately be seen. Management consultants McKinsey & Co estimate blockchain applications to begin finding commercial traction within the next 3-5 years. To date however, there has only been the odd cheer from various blockchain outfits claiming trials gone well, but quickly falling under the radar with little follow-up. IBM is certainly not alone in continued full throttle with Blockchain initiatives. This year has seen major intelligence provider IHS Market also purchase a stake in trade processing start-up Cobalt. Bank messaging giant SWIFT announced that they'll be "integrating" R3's Corda platform, with the later having already secured major banking names to test its permissioned blockchain. 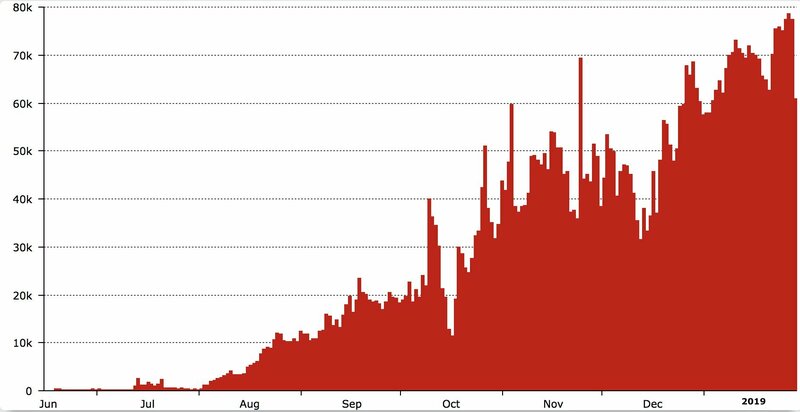 A chart published last week by Diar turned contentious on the Daily Active User (DAU) count for Decentralized Applications (Dapps) on EOS. Diar would like to clarify that it was the total for DAU per month, not the current total of daily transacting users. We aknowledge how the charted data was ambiguous. DAU is calculated on unique addresses that have interacted with the blockchain on a specific given day. The same address can and most likely is reused - however that is an assumption, not an absolute fact. This charts the DAU per day noting the underlying trend previously published. This too can be faulted with claims of network spamming. Our analysis (and chart notes) last week did wish to highlight that gambling Dapps which have found home on the EOS Blockchain are to be regarded as high-transacting activity possibly causing DAU count to be high. Then, what could be more indicative, is the US Dollar value transactions and flows on EOS Dapps as published in our previous issue (Diar, 28 January). As the old sales adage goes, the more ways to pay means more ways to buy. Binance has followed through on such mantra adding means to deposit on the popular exchange using credit cards partnering up with a third party processing provider. Near term growth from new comers into the cryptocurrency space will likely be sparse having witnessed an astounding drop in token prices. What does remain is a user base whom have already established their fiat on-ramps. What started off as a slow fund-raising from within the cryptocurrency community to support privacy geared coin Grin, has managed to come across the line with 20% more than target after the lead developer voiced his frustrations. The development team had opted to avoid fund raising through an Initial Coin Offering, and bypassed the option to take part of the miners reward, akin to the funding model for ZCash. But will the €65,000 raised thus far be adequate enough? Decentalized Organizations platform Aragon announced last week that the development team is now weighing out the possibility of launching their operating system on the blockchain interoperability focused Polkadot network, as well as on Ethereum. The announcement by Aragon whom have been of the most staunch supporters of Ethereum does place a question mark on whether more developers will jump ship to newer blockchains. Accredited investors who participated in the parent company of the Equity Token platform Neufund have began to receive their tokens. The company, Fifth Force, which raised €3.38Mn on its own platform will also begin to distribute their native tokens to equity shareholders as part of the economic model constructed to reward backers. Over €100K worth of NEU tokens, the result of a 3% cut from the sale, and 2% equity, will be at the behest of initial investors as immediate returns.